Today, more than ever, commuters are now tightening their belts in order to have some savings at the end of the month. There is no better place to start budgeting than at the gas pump! Replace some of your car habit driving with one of our motorized bikes and you'll quickly find more money in gas savings in your pocket each and every week! Just call us and we will have a complete motorized bike waiting for you to pick up! 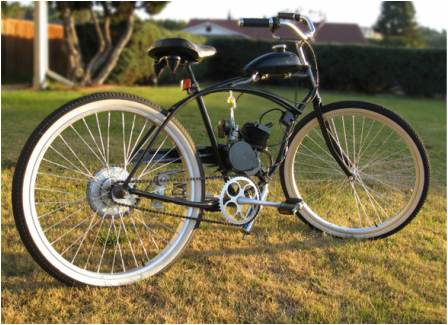 When you are ready for your very own motorized bike, please call us and let us know! You can reach us at (619) 259-4869. We would love to hear exactly what you would like in a motorized bike that will serve your very needs! Or you can bring us your own bike and have us install our top of the line motorized kit on it. Please call us first to make sure that your bike will be a good match! In order for us to better serve you, our valued customer, and to reserve your very own motorized bike please submit the agreed deposit amount. Please note that deposits are non-refundable and the outstanding balance is due at the time of pickup or delivery. Or, if you are handy with some basic tools, you can install the motorized kit on your bike yourself! Call us first so we can tell you what to expect before buying one of our kits! Our kits are the best you can find and can easily be put together on a good bike. Be sure to have good working space, patience, an open mind, some writing paper and a black marker. And of course, if you ever need any additional help, you can always call us for it! For the purchase of a complete motor kit and personal pick up of the motor kit, please choose option 1 for $250.00 to the left. 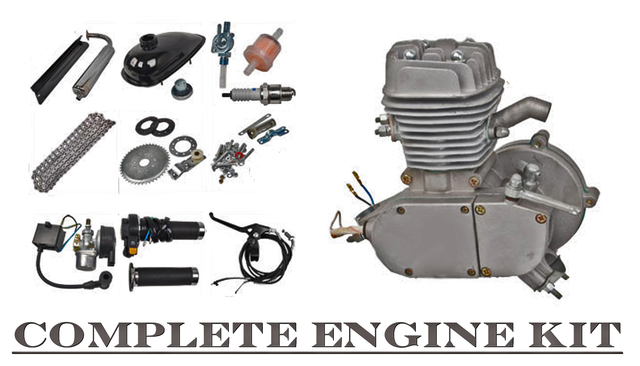 For the purchase of a complete motor kit with shipping and delivery of the motor kit within the continental United States, please choose the drop down button for option 2 for $280.00 to the left. If you have any questions before your purchase, please contact us at (619) 259-4869 and we will be more than happy to help you!